Sphere Exclusion is a simple, intuitive selection method. Clustering begins by selecting an initial structure, including all structures that meet a defined similarity threshold in the first cluster, and repeating this process until all structures are in clusters. 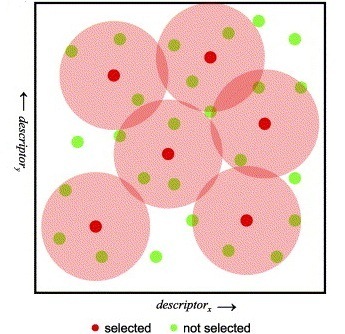 A subsequent clustering is also done as cluster formation is dependent on the initial structure and parameter selection.The structure selection process can be random or directed by some preprocessing of the structures. Clusters are defined by similarity and their number is not predetermined. Sphere exclusion is a method to select subsets, e.g. diverse subsets. The method is highly dependent on the initial element of the input file. Prepare the usage of the jklustor script or batch file as described in Preparing and Running Batch Files and Shell Scripts. Invoke sphere exclusion clustering (using dissmilaity radius 0.4) on the given data set; store input structures and present results with builtin lightweight HTTP server. When clustering process finished connect browser to http://localhost:84.